The Government of Guyana decided to take control of the Berbice Bridge from yesterday. Thus, the Berbice Bridge Company Inc. (BBCI) will no longer have jurisdiction to try to impose “unconscionable” increases on the people of Guyana. This was made known by the Ministry of Public Infrastructure (MPI) via a missive it released to the media early yesterday. The Ministry noted that the government and the BBCI have been engaged in a public dispute regarding a unilateral announcement on October 16, 2018 by BBCI to impose “draconian” toll increases at the Berbice River Bridge. 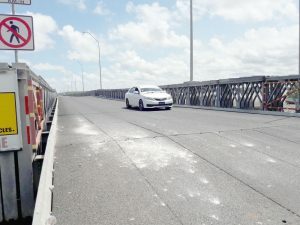 MPI said that the dispute has been ongoing for a number of years and came to a head recently when BBCI demanded a 365 percent increase on the toll for users of the Bridge, which is slated to take effect on November 12, 2018. The statement continued, “We have stated publicly that the Ministry of Public Infrastructure and the Government of Guyana cannot support the unreasonable demand for an increase in toll on the public which is based on a flawed formula and computation. MPI said that therefore, in accordance with the powers conferred upon the Minister by Sections 4 (1) and 11 of the Berbice River Bridge Act, in the interests of public safety. The Ministry pledged that it will do everything in its power to alleviate disruption to the public and ensure that the assumption of these functions is as smooth as possible. MPI sought to assure the citizens of Berbice and the public in general on behalf of the Government of Guyana that there will be no change to the present toll structure and all exemptions presently in place will remain in effect. as we transition into this new and hopefully temporary arrangement. And finally, we will be continuing our dialogue with BBCI in expectation of an amicable resolution to the dispute,” he statement said. BBCI has since officially requested a 19-year concession extension from Government as a bargaining chip to stop the roll-out of hefty toll increases for vehicular traffic. The company’s demands are contained in a letter from Finance Controller and Company Secretary, Stephen Rambajan dated November 2, and addressed to Minister of Public Infrastructure, David Patterson. The letter called for a meeting between BBCI officials and Government in order to address the matter before November 11 – a day before the company plans to introduce a staggering 365 percent increase in vehicular tolls. According to BBCI, Government’s agreement to the extension would actually give the company a total concession of 40 years. According to the Concession Agreement that was signed by the Bharrat Jagdeo administration with BBCI- the Concessionaire/Operator- the time of the “hand back” should be in nine years’ time. However, the company indicated that the extension of the concession is a means of avoiding the need for implementation of toll increases announced on October 16 and the implementation of toll increases in the immediate future. BBCI continues to be seen as a private company that was controlled by close friends of former President Jagdeo. After repeated disclosures by Kaieteur News on the leaked concession agreement, the company issued a response which confirmed that although the bulk of the money invested in the Berbice Bridge came from the National Insurance Scheme (NIS), Dr. Ranjisinghi ’Bobby’ Ramroop is the largest shareholder. A chart that was included in the response, provided details about the ownership of the bridge. It shows that Ramroop, a very close friend of Jagdeo, is the largest shareholder. NICIL has 10 percent shares in the bridge, NIS has 20.2 percent, Hand-In-Hand Fire Insurance has 10, New GPC has 20 percent, Queens Atlantic Investment Inc. has 20 percent and Secure International Finance Co. Limited owns 20 percent. Brassington’s brother, Michael, is the largest shareholder in Hand-In-Hand. The Ramroop/Brassington combination therefore puts the ownership of the bridge in the hands of Jagdeo’s close friends. The BBCI was keen to note that no single company has a majority share. However, Ramroop owns two of the companies that each has 20 percent shares. The disclosures of the leaked Concession Agreement would be shocking as it included also other sweetheart arrangements with the company, which has the possibilities to continue running the bridge and collect tolls. Berbicians who have been keeping abreast ofthe news in relation to the recent announcement to hike the bridge tolls have expressed their satisfaction over the most recent decision by the Government of Guyana to take control of the bridge, temporarily. Although many were not updated about new developments, the few that were aware said that they welcomed the move by the government. One woman said, “I seh that is a good thing the government do for us. The country ain’tgon suffer because the bridge fare would have break down the country more. So I really appreciate whatever the government has done for us”. The announcement to hike the tolls was made in October with an exorbitant raise from $1,900 for cars to $8040. Many bus operators cried out that the rise was “ridiculous”. They said that it would not auger well for their livelihood. They had made calls for the government to take over the bridge, a move they said would be welcomed. Another Berbician told reporters, “It’s a welcomed move, welcome in a sense that the previous management team was unconscionable in terms of the conditions that they had laid out. To propose a fare hike for cars from $1900 to $8000 was simply unthinkable. “What I am hoping now is that the government would apply the best management systems possible to ensure that the customers and the travelling public benefit from this decision. But let’s wait and see how things work out. But for me it’s an extremely welcomed move as compared having to face paying $12,000 to go to Georgetown”. During a visit to the toll entry/exit at the Berbice Bridge yesterday morning, members of staff told this publication that they were not aware of any takeover from the government. They informed Kaieteur News that the person in charge was not in Berbice but was engaged in a meeting in Georgetown and that there was no-one in authority that could speak with us. They were somewhat hesitant to allow the media to take pictures of the bridge and its toll entry/exit point but eventually submitted and allowed access. A press release issued by the Ministry of Public Infrastructure, stated that the Government of Guyana and the Berbice Bridge Company have been engaged in a public dispute over the announcement on October 16,2018 by BBCI to impose the “draconian toll increases at the Berbice River Bridge”. They highlighted that the dispute which has been going on for several years came to a head recently when BBCI demanded a 360% increase on the toll for users of the bridge. That hike was slated to take effect from November 12, 2018. The Ministry stated that it has made it public that “the Ministry of Public Infrastructure and the Government of Guyana cannot support the unreasonable demand for an increase in the toll on the public which is based on a flawed formula and computation”. Against the backdrop, on the basis of correspondence between both sides as recently as over the past few days, the government said that they do not envision a swift resolution to this crisis and therefore, in accordance with the powers conferred upon the Minister by Sections 4 (1) and 11 of the Berbice River Bridge Act, in the interests of public safety, the Minister issued (yesterday) an Order declaring that the functions of the Concessionaire to maintain and operate the Bridge shall be exercised by the Government of Guyana as of November 5, 2018 until the date the Minister specifies by notice on the cessation of the threat to public safety”. However, the government gave assurance, that it will do everything in its power to alleviate disruption to the public and ensure that the assumption of these functions is as smooth as possible. “The truth is, too many of our citizens are dependent on the continuous operations and use of the Berbice Bridge and we should not allow anyone to unreasonably and capriciously endanger their livelihood and public order in one of our vital regions. “The Ministry of Public Infrastructure would like to assure the citizens of Berbice and the public in general on behalf of the Government of Guyana that there will be no change to the present toll structure and all exemptions presently in place will remain in effect.” The Ministry has also made it clear in the statement that there will be no change to the staffing complement, contractors and suppliers as they transition into the new and hopefully temporary arrangement. The Ministry assured that dialogue will continue with BBCI in expectation of an amicable resolution to the dispute. 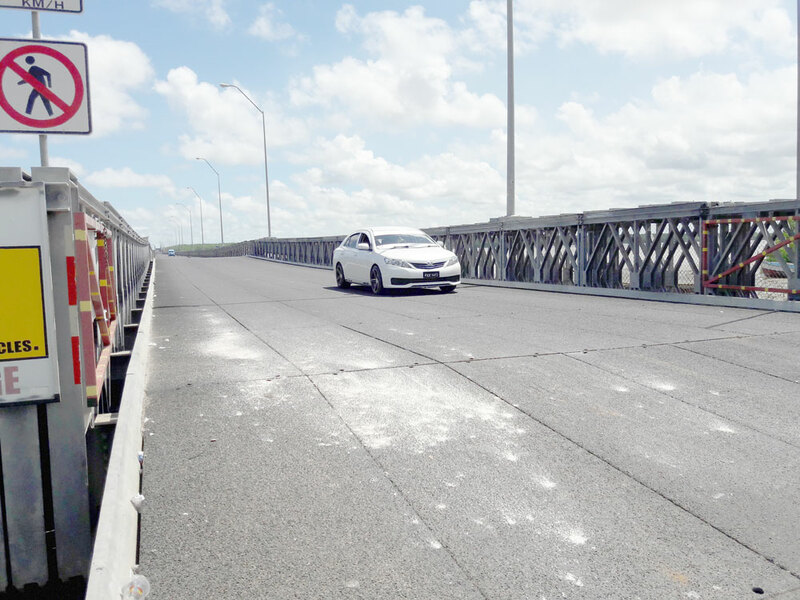 Berbice Bridge Company Inc. (BBCI) has officially requested a 19-year concession extension from Government as a bargaining chip to stop the roll- out of hefty toll increases for vehicular traffic. The company’s demands are contained a letter from Finance Controller and Company Secretary, Stephen Rambajan dated November 2 and addressed to Minister of Public Infrastructure, David Patterson. The letter which was released yesterday by the company called for a meeting between BBCI officials and Government in order to address the matter before November 11 – a day before the company plans to introduce a staggering 365 percent increase in vehicular tolls. According to the Concession Agreement that was signed by the Bharrat Jagdeo administration with BBCI- the Concessionaire/Operator- the time of the “handback” should be in nine years time. BBCI stated that if Government agrees to the extension, it will withdraw the implementation of the toll increases, which were announced on October 16. “We believe that such an extension, with full Government support, will provide BBCI, as the Concessionaire, the opportunity to approach its lenders to re-negotiate terms and conditions of the various debts. If these negotiations with the lenders are successful, it will provide much needed relief to the cash requirement burden and therefore, the need for toll increases at present and in the future,” BCCI indicated to Government. The company stated that it is convinced that its new proposal will allow the tolls to remain as they are and provide opportunities for toll reduction in the near future, removing the need for Government subsidy to the tolls and maintenance of pontoons. Patterson has denied the bridge’s bid for the toll increase. e Berbice Bridge and de Marriott Hotel is two Jagdeo projects that he design. And to put he mark pun dem he call dem PPP projects. De PPP stand fuh Public Private Partnership. That simply mean that govt join wid private people to put together projects to benefit all. All over de world both govt and de private investors does benefit. But in Guyana Jagdeo, that scamp design de Marriott and de Bridge project plan fuh benefit de private people only. De Marriott actually cost US$100M. De private people barely put in US$20M. De Govt put de US$80M. Guess what? De hotel is only mekking to pay de private people all of who is Jagdeo friends. That is how Jagdeo; that scamp, Brassington, that fat crook; and Ashni, de shaat vagabond, design de hotel contract. He tun and do de exact thing wid de Berbice Bridge. Dem seh de Bridge cost US$45M. De private people put less than US$8M. De govt put de US$37M. De Bridge wukking fuh 11 years. It pay de private people, who is Jagdeo friends again, more than de US$8M dem invest so far. Dem never attempt to repair anything pun de bridge. Yet dem want increase so high that fuh de next nine years dem would collect more than de US$45 M wha de bridge cost. Dem boys seh de Berbice Bridge contract and de Marriott contract got de founding fathers turning in dem grave. Dem boys fully support de govt decision to tek over de bridge, pay dem back dem money and lock dem up. Dem boys want govt to do de exact thing wid de Marriott. Give dem back de few dollars and dump dem in de Atlantic Ocean without any lifejacket or paddle. Then de govt should offer de same shares to de ordinary canecutters, teachers, policemen etc. After all dem poor people gun be happy to know dem gun carry home an extra dollar. As fuh Jagdeo retribution waiting fuh him over de things he do to de poor people of de country. He tek de scampishness further. De man design de project in such a way that both projects couldn’t mek enough to pay de fat rate of returns he offered ee friends. De contract seh he had to pay suh he use to tek money every year from de treasury to pay he friends. Imagine you put de hog of de money in two project then got to tun round and push you hand in you pocket to pay de odda people who put in next to nutten. And all because you promise dem de gold spoon. Talk half and remember when you got a cash cow you would do anything to protect it. Why are those in power more interested in constructing the hugest story hotels which cost hundreds of millions of dollars, but ignore the plight of us here in GT because there are almost NO JOBS to speak of, and Trinis are getting all the offshore oil work. He would tell folks to BOYCOTT THE BRIDGE UNTIL JAGDEO AND CO AGREE TO RELINQUISH all holdings of the bridge. Then the gov’t should change the fare to a reasonable rate for the taxpayers.